One New Replacement John Deere Tractor Radiator Fits: 4010 Gas & Diesel. OVERALL HEIGHT: 31 1/4 OVERALL WIDTH: 20 1/2 CORE HEIGHT: 24 1/2 CORE WIDTH: 19 1/4 DEPTH: 2 3/8 ROWS: 4 FINS PER INCH: 9 FILL NECK HEIGHT: 1 1/4 INLET: 2 OUTLET: 2. Replaces Part Numbers: AR46438, AR26551, AR3402, AR26569, AR31581, AR31582. Our processing system is automated. Thank you for your continued patronage. 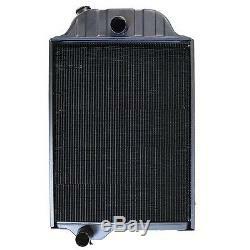 The item "AR26551 Radiator Made To Fit John Deere Tractor 4010 Gas Diesel" is in sale since Wednesday, June 08, 2011. This item is in the category "Business & Industrial\Heavy Equipment Parts & Accs\Tractor Parts". The seller is "reliableaftermarketpartsinc" and is located in Williamston, Michigan.